Many plants produce natural insect repellants as a part of their defense systems and some of these are widely used in prepared powders and liquids in the garden and the home. Derris, commercially known as Rotenone, is a popular organic insecticide extracted from the powdered roots of a Malaysian shrub plant often referred to as “Tuba”. In the garden, herbs like Tansy, Rue and Pennyroyal are grown near other plants to deter pests. Many plants have been found to repel Whiteflies and other pests in the Greenhouse. And scientific experiments have proven that some herbs and flowering plants emit volatile chemicals into the air and provide protection from insect attack. Some of these have proven to be toxic to Mosquitos that carry Malaria and Yellow Fever and have been used successfully in ravaged third world countries. It is currently hoped that new generations of insecticides and deterrents can be developed from Herbs. One of the most successful has been the use of Pyrethrum, a single-flowered Chrysanthemum. 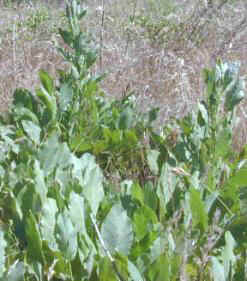 Nontoxic to mammals and animals but deterrent to all insects, Pyrethrum is the most useful plant in insecticide making. A simple use is to sprinkle dried, powdered flowers anywhere bugs may light. It will chase off bedbugs, cockroaches, flies, mosquitoes, aphids, spider mites and ants. It can be used on plants in the garden and in the bedding in the home. It is safe for use in kitchens and pantries. The active ingredients in Pyrethrum are not water soluble. To make a spray for home use, steep 4oz of Pyrethrum powder in 1/4 cup of Denatured Alcohol and then dilute with 13 gallons of water. Always apply to outdoor plants at dusk and not in the morning, to be sure not to kill Ladybugs, Butterflies and Bees. In the home, use where you like but don’t overdo it. Be careful around Aquariums, as it will kill Toads, Frogs and Fish. Garlic is another natural repellent for many insects. Used in the garden, it will chase off Aphids and Whiteflies. Used in the kitchen, it will deter Ants. Among Herbs, the mighty ones include Wormwood, Rue, Hyssop, Savory and Santolina. Strew dried herbs anywhere you wish to deter insects. In closets, on shelves, in pantries, among clothing, under cabinets, in basements and attics. Placing dried sprigs of Southernwood or Costmary under carpets will deter Beetles and Moths. Hanging branches of Elderleaves in the kitchen will deter Flies. Lavender and Rosemary also have insecticidal qualities and have been popular since the middle ages. Mix all together and use in any of these ways: Strew on floors, carpeting, linens or bedding; make up into cloth bags and stuff into drawers or closets; make up into drawstring bags and dangle from hangers in closets, bedrooms or dressing rooms; put into dishes and slide onto shelves in cabinets or pantries; stuff into old nylons and place under couch cushions, mattresses or lounge chairs. NOTE: THIS RECIPE WAS TAKEN FROM THE BOOK “THE TOILET OF FLORA” WRITTEN AND PUBLISHED IN 1775. A GUIDEBOOK FOR TOILETRY AT THE TIME. Make up this mixture and use in various ways: Strew under bathroom carpets or behind toilets; stuff into cloth bags and tuck away in bathroom cabinets or linen closets. This mixture smells good enough to be put right out in the Living Room like Potpourri. It is especially good at repelling insects like waterbugs, cockroaches and spiders. It should be used in quiet, dark, damp places to be the most effective although it does smell good enough to be left out to deter ants and flies in the Kitchen and Living Room of the house. This is an excellent, scented mixture that can be used in various ways both on the body and around the home. The dried herbs can be mixed into a bottle of Witch Hazel and Glycerin and left in a window for a week to warm up. After the bottle was warmed for a week, you can shake it and then apply it directly to the body. It will smell like a rub or a medicine but it will keep the bugs off. Around the house, you can strew it under rugs or cushions; put it in jar lids or coasters and leave it out on countertops; hang it in cloth bags over doors or by windows. It is most effective at deterring flying insetions, so aim to use it to ward off flies, wasps or mosquitoes. This mix is especially useful in the kitch to deter flies or around an outside table when dining and being bothered by mosquitoes and other flying bugs. BEING MAKING THIS, PLEASE NOTE: This mixture is VERY PUNGENT. You will smell it strongly wherever you put it! It be a Lemon-Pepperment smell that is not offensive. However, it is very pungent as a strong mixture is needed to deter roaches. These bugs resist almost everything, even poisons they can become immune to. But this mix is strong and offensive to them and will make them scatter and leave. Mix all the ingredients together well. The crushed leaves will be extremely pungent at first. Place on trays, coasters, pieces of cardboard or paper plates and put this under sinks, behind toilets, inside cabinets, near the stove or under it, anyplace where roach bugs hang out. Putting this mix directly under appliances near the front or rear entrance is a very good spot. Pantries or cabinets where food is spilled, left open or otherwise accessible are also good places. Put the tray way in the back of cabinets where the mix could be tipped or spilled. too much scattering or spilling of this mix will eventually dim the scent, and therefor its effectiveness. Also, roaches tend to lurk in the back and dark areas most of the time and often go unseen. NOTE: THIS IS STRONG SMELLING AND OILY BUT IT WORKS!! Put all of these ingredients into a bottle with a stopper or lid. Shake it up really good and store it away from light. It is preferable it be kept in a blue or dark brown bottle. Light will destroy it rapidly. To repel pests, rub a small amount between the palms of your hands and apply lightly to exposed skin. This is strong smelling so YOU DO NOT NEED A LOT! AVOID applications to the face to prevent contact with the eyes. Reapply as necessary. NOTE: IF A RASH DEVELOPS, DISCONTINUE USE IMMEDIATELY. This oil can also be put in a Kerosene Lantern and burned. The scent will chase off Mosquitoes and Moths. THIS WILL WORK FOR BOTH DOGS AND CATS. EVEN HAMSTERS!! Put the herbs in a 2-quart saucepan. Pour over with boiling water and allow it to steep for over 30 minutes. When the infusion has warmed and water smells strongly, strain the herbs out of the liquid through a cloth or wire strainer. Now, dilute the water with 4 quarts of warm water. Saturate the animals coat with this herbal water thoroughly so that the fur is totally soaked. DO NOT RUB THE ANIMAL WITH A TOWEL. Allow your pet to shake this off and air dry naturally. USE THIS AT THE FIRST SIGN OF FLEAS! Now these are some great recipes you can get right into! They are easy and fairly inexpensive to make and they are safe and environmentally balanced. I will have more of these in future posts, so keep you eyes on my site! I had a vegtable garden but unfortunately i have been providing more for insects than for myself. I not to use chemicals for insecticides, I was watching a programme where it is suggested to plant a certain herb with a certain vegtable to chase away the insects. Could you help me with some information or refer me to someone who can help me. PS I found your website amazing. Very helpful especialy the herbs used for fleas on your pets. This is a really hard question to answer. Almost any herb will work to drive away bugs but it depends upon what type of bug and what plant you are protecting. You can also use beneficial insects to eat up the bad ones or you can make up your own soap spray to drive off bugs. But it always depends on what type of bugs. I will keep trying to update my blog with new posts on this sort of pest control, especially as we enter the Spring and people are now becoming interested in growing their own food. Thanks for reading my blog! Gorgeous pictures of herbs! Do you grow them all yourself?